Words matter. Names, too. Just ask the Germans. There is no “Hitler Boulevard” or “Goebbels Avenue” in Germany. After World War II, Germans were determined to remove everything that glorified the people that had committed or ordered unspeakable crimes during the Nazi era. Buildings were torn down. Statues were removed. Streets were renamed. Even if that meant tearing down a monument honoring a distinguished member of society. “Am Spitzenbach” in Bad Honnef, a pretty little town at the Rhine River, is a small street with big trees and neat houses. A home for the ederly is situated here, and at the stop “Am Spitzenbach”, you can catch the 66 streetcar that gets you to Bonn. A little add-on to the official street sign, however, indicates that “Am Spitzenbach” used to have a different name: “Göringallee”. It was in 1903, reports the General Anzeiger, when the city of Bad Honnef renamed what was until then called “Rommersgasse”. By changing the name to “Göringallee”, they wanted to honor one of the distinguished members of the town. Mathias Heinrich Göring, born in 1823, was an active and generous member of the Lutheran church in Bad Honnef. He was appointed “Kirchmeister” and oversaw the church’s funds, buildings and projects. He also donated money, for example to buy an organ for the church. 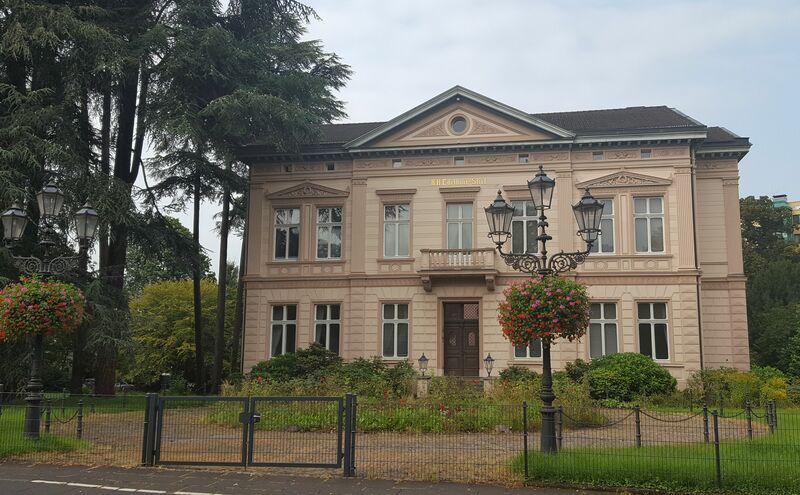 In 1870, he built the villa that is today known as “Edelhoff-Stift“, right at the corner of Hauptstraße and what used to be “Göringallee”. Göring and his wife Charlotte spent many summers in their house built in the Late Classicist style. In 1910, Mathias Heinrich Göring was even given the freedom of the town for his civic engagement. Bad Honnef’s honorary citizen died a couple of years later, in 1916. But after World War II, Bad Honnef and the citizens who lived on “Göringallee” had a problem: The name “Göring” was now associated with one of the criminal masterminds of the Nazi era, “Reichsmarschall” Hermann Göring, who had held, among other posts, the one of Commander in Chief of the German Air Force. He was supposed to be Adolf Hitler’s successor and he was the one who had given orders to coordinate the “total solution” to the “Jewish question.” At the trial in Nuremberg, Hermann Göring was the highest-ranking Nazi official, convicted and sentenced to death. He committed suicide on the eve of his execution. How do you explain to foreigners that the patron of the street you live in is not the despised Nazi criminal, but a distinguished member of your town from another era? And, what is more, how do you avoid giving the impression that you honor the Nazi criminal? To the citizens of Bad Honnef, there was only one answer. “Given the difficulties the name “Göringallee” presents”, quotes the General Anzeiger in its report, in June of 1946, the city council “recommends to rename the street”. The street signs got replaced. There was added, however, a little sign below the new name “Am Spitzenbach”, to remember the honorary citizen who unfortunately shared the same last name with a Nazi criminal.